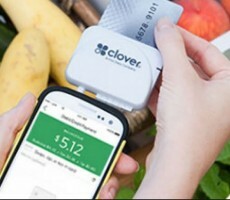 Mobile Pay (Clover) accept swipe, dip or contactless payments with your smartphone or tablet. Clover's payment processing solutions is safe and secure. Your data is synced to the Clover website wherever you are. Just login to your account to see the web enabled dashboard and download the app to view on your mobile device. Unlike Marketplace, Mobile Pay (Clover) do not offer an option to directly deposit the funds to your FOAPAL. A journal entry will be manually processed at the end of your event by the Controller's Office. How to request for Mobile Pay? Click Here to complete a Mobile Pay (Clover) request form. Wait for 3-5 business days for the Controller's Office to set up the equipment. A notification will be sent to you once it's ready for pick up. A quick training when you pick up the device. What to do after your event has ended? Go to Clover Online using your clover login information to review your transactions. Return the equipment back to the Controller's Office by the return date from your request form. The Controller's Office will run reports and book the transactions in Banner based on the FOAPAL information you have provided from your request form. Review your Mobile Pay transactions to your Budget Query - This is a very important step in the process. Like a cash/check deposit, you are responsible to ensure the money that you deposited is accurately processed to the expected FOAPAL (Fund/Org/Acct). It is the same expectation for Mobile Pay. Please contact the Accounts Payable Team (Mary Garland ext. 1098 and Colleen MacDonald ext. 1247) for any questions.